It was more than 20 years ago. Back then, the chances to encounter Ozu’s works were relatively limited. The VHS catalogs or theatrical screenings usually consisted of works from 50’s and 60’s, the later masterpieces. So when I found “There Was A Father” was scheduled on late-night TV, I was quite excited. It was probably around ’86 or ’87. It made quite an impression on me. The print was in a miserable condition, but through scratches, specs, damages, flickering and shaky frames, the ethereal world lost to us emerged. Since then, I was quite captivated by the film. It was not that I liked the story. In fact, I found its reactionary moral preaching rather heavy-handed and was not at all convinced by the father-son relationship portrayed. Direction was superb, as you might expect from Ozu, but there was something more than that. I was not able to grip what fascinated me. From time to time, I contemplated about it, my fascination about this film. If I attempt to describe what I saw, I would say it was this strange darkness dissolved in the air beyond the lens. What I was not able to grasp was if it was really a dark film in terms of its images, or its theme filtered my perception of the images. I was not able to place this “darkness” in the broader scope of cinematic art. It was one of those strange experiences you cannot explain very well. I had seen many noirs, especially John Alton’s works, and love them deeply. I love German Expressionist films and their works in Hollywood. But I felt this film had a different kind of darkness. It’s not dark guys doing dark deeds in dark alleys. It’s not dark twisted figures contemplating dark thoughts in dark twisted sets. I felt inexplicable tragedy in its theme. This film was supposed to portrait the “family value” as the war-time Japanese government saw fit, while Ozu must had worked thoroughly to make it as universal as possible. But somehow, the mysterious dark fog was hovering over, I thought. Some images of the films were reiterated in my memory and deformed into black haze. I read some reviews and analysis on the film, but few of them noted the “darkness” of the film. Rather, majority describes the bonding between the father and the son, and their tranquil meetings. Especially on the river. I was puzzled. I did like the scene on the river, but it was like a frail hologram just about to vaporize into complete darkness. But maybe I was wrong. Is it because its theme deals with the death of the father? Is it because the print condition was horrible and image quality was extremely poor? Or maybe contrast and brightness setting on my TV were screwed up? Since then, I saw the film several times. On screen, on TV, and on PC displays. But, probably because of repeated viewing of, reading about, and re-viewing of the film, under various (sometimes completely unsuitable) environments, I found the initial impact had receded into my cerebral cortex. Then, I encountered two articles recently, which prompted me to think the matter further. They are both commentaries from the time he film was produced. This remark was made after the film release (published on one of the trade magazines, I think). Ozu was trying to emphasize the joy of father-son relationship even in the toughest circumstances. But this seems to be a very strange remark as if there were people who resented (publicly) about young men being drafted and sent to war. The film was released just a couple months after the Pearl Harbor attack. The nation’s war political machine was in full gear. Even if there were people who were unenthusiastic about the marching soldiers, they would not be so vocal about it. I sense there is vague ambivalence, very calculated and deeply hidden, in this remark. Also, this resolved some of my knots about the film. Flatly speaking, this guy is a horrible father. He seems to be (truly) glad his son passed the draft medical check (and sent to war), he asks his son to be patient and asks colleagues daughter to marry his son as a dying wish. I always thought the ending of the film to be horribly tragic, with the strong suggestion of son’s coming tragedy and another family torn apart. But I thought I was reading the film after the fact. The son would be sent to Iwo Jima or Indochina, marching through the horror of the war. I could imagine such grim future about him since we know what came after. But this remark suggests that reading (public or not) was not far off, or plausible even at the time of the film release. Another commentary was by Kouzaburo Yoshimura, writing about the Japanese film direction. This was published as a series of essays in trade journal in 1942. The reason why the images of Japanese cinema is much more contrasty than those of Western cinema is that Japanese have dark hair. In order to bring up the detail of the hair in close-up shots, you have to use excess amount of lighting on actor’s head. This, in turn, delivers too much lighting on his/her face, which throws off the balance between principal and background. Of course, you can reduce the amount of lighting on the face, but it is not as easy as it sounds. Because actors move. Even though this assessment may sound trivial, I believe these problems were quite essential during actual production. And this may indicate that Japanese films of the era may have the characteristic darkness or contrast as Black-and-White images. Then both the theme and the image of the film may be as “dark” as I had imagined. Are images in “There Was A Father” really dark? Or which scenes are dark? Are these darkness connected to the narratives of the film? But “dark” is a relative term. Sometimes, people use it when they actually mean “contrast”. Through a series of thought experiments, I realized I did not have appropriate data to contemplate. 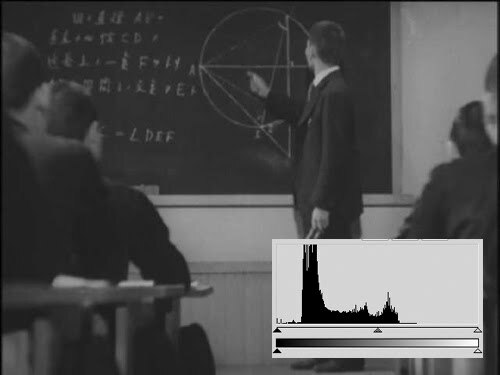 Then I said, why not take the images from the film and analyze them as a gray-scale histogram? The gray-scale histogram shows the power distribution of white-black gray scale calculated from whole image. So if the image is completely black, the histogram has only one peak at 0 (zero) and nothing else. Depending on how many bins (divisions, 32, 128 or 256) are used for the histogram, all white image will have only one peak at 32, 128 or 256. Most common grayscale is 8-bit, which has 256 levels in its grayscale. If the histogram of the image has more power on black end of spectrum, the image can be considered to be dark. You can see the histogram of any images on any of the modern image processing software (i.e. Photoshop, GIMP…). 1. Frame grabs at the interval of one second were taken for the whole film. This produced total of 5208 gray-scale images. 2. Each image was processed to create the histogram. 128 bins were used. The created was the large table of 128 x 5208 in size. 3. The java applet was created to present data in this blog. To present data for visitors to comprehend easily, 3D plot (time-grayscale-power) is used. And each histogram trace will call the thumbnail of the image, so that visitors can look through the data and do his/her own analysis. First, I had to choose the video stream source. I picked a bargain DVD from Cosmo Contents. Judging from multiple experiences I had with the film, this version is reasonably clean in its images. Of course, I contemplated about using digitally restored version as a source material. The discussion about the source material actually touches the very core of this whole analysis and film appreciation itself, which would require more space and time to discuss. At this point, let me just say this; each data must be interpreted carefully and must be analyzed with the very poor condition of the source material (the survived print) in mind. Whole process to build data and scripts took several weekends. Frame grab was easy. There are many free programs, which do the automatic frame grabs, available on the net. Creating histogram was not so hard, either. Java applet part was the toughest. I used Processing since I am used to it. Upload the data and thumbnails, link them and did many bug-fix. Finally, it is working. 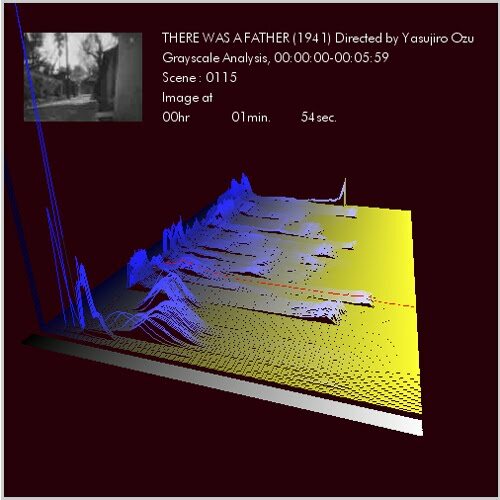 This is the first 6 minutes of “There Was A Father”, grayscale analysis plot. The applet will ask for permission, press “allow” to load it. If the applet does not appear in a minute or two (depending on network environment), please reload the page (hitting reload button a couple times do the trick sometimes). The applet just like the image on the top of the page should appear. On IE, “Access Data Sources Across Domains” should be enabled in the Security settings (Tools – Internet Options – Security Tub – Custom Level). Firefox, IE tested. Chrome, Safari and other browsers are not tested. iOS devices do not permit Java applets. I decided to divide the whole film into 6 minute segments (15 of them), so that the 3D plot is presentable. I would start the analysis on the next post, and am planning to upload one plot in one post. I am processing “How Green Was My Valley” by John Ford and “Late Spring” by Ozu for comparison. I have selected John Ford’s film since it deals with the similar theme/value (family, father-son relationship, devotion, work and life) as “There Was A Father”. Since Hollywood cinema creates different cinematic space, the comparison will be interesting. “Late Spring” was filmed several years after “There Was A Father”. I assume that modus operandi of the production was not that different for these two films, though the war affected them in different way.